1. Mix the instant coffee with warm water and set aside. 2. For the coffee layer mix agar-agar powder with water bring to the boil over medium heat in a saucepan. Stir continuously until all the agar-agar dissolves, then add sugar Continue boiling until the sugar, add mixed coffee, stir well, and then turn the heat to the lowest. 3. For the coconut cream layer mix water and agar-agar powder together, bring to the boil over medium heat. Boil until the agar-agar dissolves, and then add coconut milk, sugar and salt together. Stir regularly to prevent the coconut cream separating. Being to slow boil until the mixture dissolve completely, turn down the heat to the lowest. 4. Spoon 1 1/2 tablespoonful of the coffee mixture into each mold, leave to set. Scratch the surface lightly with a fork and then spoon the same amount of the coconut mixture over and leave to set. Continue with this process until each mold is full. Leave to completely cool before remove from the mold. Note : Since the layer is so thin it will set in 2-3 minutes. Biscuit is really great and can be serve with all kind of dishes that are savory or sweet. They are tasty and really easy to put together. Have all your ingredients ready and mix them up as soon as the oven is hot and soon you will have light and fluffy biscuits. Feel free to vary the herbs to suit your taste. This biscuit is also great as a topping for pot pies in place of rolled crusts. 1. Warm up the oven to 400 degree F. Line the baking sheet with some parchment paper. 2. Combine all dry ingredients in large bowl and mix well. Add butter to bowl and rub into flour mixture with your fingertips until mixture resembles very coarse sand. The average piece should be about the size of a pea. 3. Stir in beaten egg and then slowly add in the milk until the dough is moistened. 4. Turn out on to a lightly floured surface and lightly knead until the dough comes together like a ball. Press dough out with your hand until it is about 3/4-inch thick. 5. Use a round cookie/biscuit cutter to cut rounds and then place on baking sheet. Dough can be gathered and rerolled once. You should get about 10 biscuits, depending on size of the biscuit cutter. 6. Brush the top of the biscuits with some milk, sprinkle some pamersan cheese (optional) and bake for 20-25 minutes, until tops of biscuits are golden brown. Note: You might not need the whole cup of milk and you can substitute milk with buttermilk to add a nice tangy flavor to the biscuits. Beef Stew in Red Wine. It’s officially spring on Friday but the weather here is still very cold. We love having stew in this wintery kind of weather. There's something so comforting about a bowl of deeply rich succulent braised beef with carrots, onions, and potatoes. It's hearty, wholesome and simply delicious. This beef stew is flavored with red wine, thyme, and orange peel. Sounds fancy, doesn't it? It's not, and it is really easy to prepare. I serve the stew with some homemade biscuits but you can have it with rice, warm crusty bread or mashed potatoes. 2. Brown the beef in the hot pan, being careful not to over crowd the pan, you might have to work in batches. Thoroughly brown all of the cubes on all sides. Once all the meat has been browned remove it to a plate. 3. Add in a bit more oil if needed to the pan and add in garlic and onions. Sautee for a few minute and add in the wine to the pan and bring up to a simmer while you scrape the bottom of the pan with a wooden spoon being sure to loosen up all those tasty brown bits. 4. Once the wine has gotten hot add the browned meat, thyme, orange zest strip, bay leaves and beef stock. Bring the mixture up to a boil and then reduce the heat to a simmer, cover and cook on low heat for 2 hours. 5. After 2 hours add in potatoes and carrots. Turn the heat up slightly and simmer, uncovered, for 30 minutes more, until the vegetables and meat are tender. Check seasoning and you might need to add a bit of sugar to balance out the acid from the red wine. Serve warm. Note : Homemade Herb Biscuits recipe coming up next. Our breakfast over the weekend is usually very simple. We will have coffee and maybe an English muffin or a piece of toast but there are days we yearn for something heavier. Since Diana got me a waffle marker for Christmas I thought I make some for breakfast. Actually making waffles is not that difficult. You just have to mix all the ingredients and put some batter on the waffle maker and you will have freshly bake waffles in minutes. Best of all you can put any topping you want. Why not make some for your family this weekend. 1) Sift flour, baking powder and salt and set it aside. In a mixing bowl mix egg yolk ,sugar and milk together. 2) Then add in sifted dry ingredients. Beat egg white until stiff. Fold in egg white into the flour mixture. Mix in melted butter. 3)Get ready your waffle maker according to the manufacturer instruction. Put batter into your waffle maker (amount will depend on your waffle maker). 4) Serve warm with butter, syrup or fresh fruits topping. Note : You can always freeze up any extra waffles and just warm it up the next day. When I cook rice I will always cook extra so I can make fried rice the next day. This dish is a nice change from your ordinary fried rice. A very popular dish at the Thai restaurant serve in a hollowed out pineapple shell and you've got a show-stopper if you serve this to your family or any get together with friends. 1. In a wok or a large pan, heat up about 3 tbsp of oil over high heat. 2. Add in onions and garlic and stir-fry until lightly brown and fragrant. 3. Add in chicken, stir-fry until it changes color, add in pepper and shrimps. Stir fry for another minute and add curry powder, fish sauce and soy sauce. 4. Add in rice and pineapple chunks. Stir-fry until everything is well combined and hot. Check seasoning and add salt if necessary. Add in spring onions. 5. Serve rice in pineapple shell and garnish with some spring onions. I know this is not the healthiest dish of all but who cares. We need to indulge ourselves once a while. I just need something comforting in this cold weather. Not the fried chicken from KFC or Popeye’s but some good old Malaysian style fried chicken. A lot of Malaysians like their chicken deep-fried, crispy and golden brown and loaded with spices. Chicken pieces done this way are common in what we call the Mamak restaurants or the Indian restaurants. Here is my version of Malaysian style fried chicken. 1) Put the clean chicken in a large container. Mix in all the spices except for the flour and mix well. Marinate for at least 4 hours before frying it. 2) Heat up some oil for frying. Coat the chicken with glutinous rice flour and fry the chicken over medium heat until golden brown and cooked. Drain off oil on paper towel. 3) Serve with your favorite chili sauce or it taste as good on it own. Note : You can coat the chicken with flour but glutinous rice flour gives a really crispy chicken. My oven is back in action again. Bake this simple cake for our breakfast. The sour cream makes this cake rich and keeps it really moist. My favorite part of this cake is the crunchy streusel topping. The next time I bake this cake I will add some nuts to its topping. 1. Preheat oven to 325F. Lightly butter a loaf pan. 2. For the streusel combine flour, butter, brown sugar and cinnamon in the bowl and mix well. Set it aside. 3. Sift together the flour, baking powder and salt. Set aside. In mixer, cream the butter and sugar on medium speed until light and fluffy, about 2-3 minutes. . Then add eggs, one at a time, mixing well after each addition. Mix in vanilla extract. 4. On low speed, add a third of the flour and mix until the flour is just barely combined. Then mix in half of the sour cream. Repeat with another third of the flour, the remaining half of the sour cream and then the last third of the flour. Stir in chocolate chips with a spoon or spatula. 5. Spread the batter into your prepared loaf pan. Sprinkle the streusel over the batter. Bake until golden brown and a cake tester comes out clean, about 50-60 minutes. Let the cake cool in the pan for 15 minutes. Then carefully remove the cake from the pan and let it cool completely on a rack. I always like Hong Kong Noodles and I will usually pan fried it and cook some grave to pour over the top but this time I just stir-fry it like other noodles. 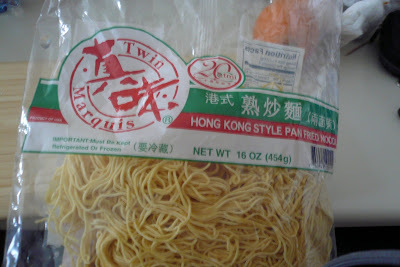 This is not an easy noodle to fry as it clump up easily but the taste was really good. I will definitely cook this again. 1) Wash off the flour from the noodles and drain well. Mix all the sauce ingredients in a small bowl and set aside. 2) Put about 2 tbsp of oil in a hot pan and stir-fry onions and garlic until fragrant. Add in meat and continue to stir-fry until the meat is cooked. 3) Add in pepper, carrot and shrimp. Stir-fry for a minute and add in the noodles. 4) Stir-fry a few second and add in the sauce. Continue to stir-fry until the noodles is cook and the sauce dries up. Add in the beansprout and stir-fry a few second or until everything is well combined. Sorry for not updating my blog for such a long time. I just got home a few days ago and now my kitchen is back in action again. I cooked this tofu dish for Diana and myself. Both of us love tofu cook in any ways. It is healthy and great source of protein and we can eat it everyday. This is a great dish to eat with rice especially the crispiness of the Tofu with the spiciness of the topping. Try it, and I'll bet you'll get hooked to it! 1. Heat oil in a pan and fry tofu till it gets golden brown. Remove from heat, drain the oil on paper towel and keep aside. Remove the oil from the frying pan leave about 1 tbsp. 2. Add in garlic and onions and stir-fry for a minute and add in prawns, peppers and carrots. Stir-fry for a few seconds and add in the chili paste. 3. Continue to stir-fry for a few seconds and add in the soy sauce and sugar. Stir until well combined and pour it over the fried tofu. 4. Garnish with spring onion and serve warm with rice.